It’s that part of the class where your teacher shouts those dreaded words: “now it’s your turn to improvise”. You freeze up, your mind goes blank and – despite the fact that you’ve learned oodles of bellydance steps and techniques – you have no idea what to do. For some reason, having to improvise makes us feel super vulnerable and self-concsious. But the answer to this isn’t to try and do away with those feelings, it’s to understand that these feelings are part of the experience of improvised bellydance. Whilst I don’t, by any means, claim to be any kind of guru on improvisation, I do have some top tips that I’ve gleaned from teaching this topic for many years. Improvisation seems to be going out of fashion in the bellydance world (I’ll dare to say that I think we, as teachers, even avoid demanding that our students improvise for fear of putting them off coming to class. Therein a vicious circle begins). So in today’s video, I want to, gently, help give you some assurance that YOU CAN DO IT! 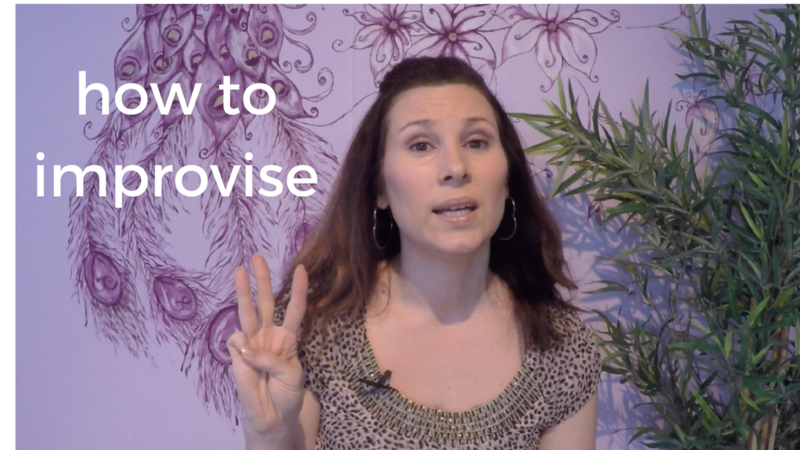 If the idea of improvising to a bellydance song sends you into a panic, today’s post is for you. I’d love to know what you thought of today’s video, do leave a comment on youtube if you have any tips, experience or thoughts to add! Ps. Are you in the loop? Subscribe for blog updates with bellydance tips to get on track and stay inspired. Plus receive my free online class! Go here to get yours.